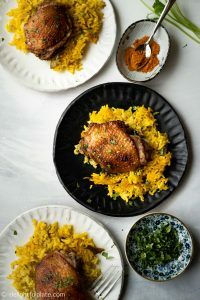 This One Pan Chicken and Turmeric Rice is made using classic Asian flavors. 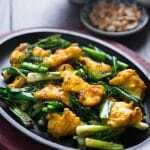 The chicken is tender and the rice is so fragrant with beautiful yellow color thanks to turmeric and a secret ingredient. Incredibly delicious and healthy! 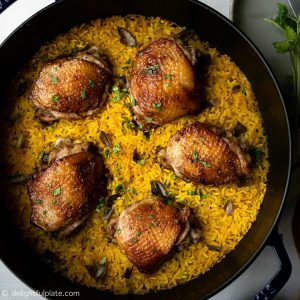 We can easily find a lot of one pan chicken and rice recipes on the internet, but I haven’t seen one with Southeast Asian flavors. 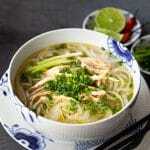 That’s why I decided to create one featuring classic Asian ingredients and flavors. 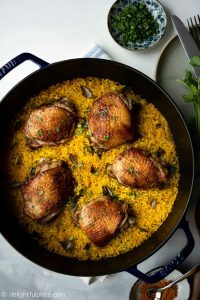 The chicken and rice are cooked together in one pan in the oven, making this dish ideal for busy weeknights. 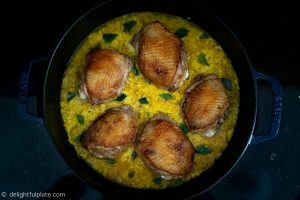 I love how moist and tender the chicken turns out, but really the star of the dish is the turmeric rice! Cooked in chicken stock, the rice also absorbs juice from the chicken on top. 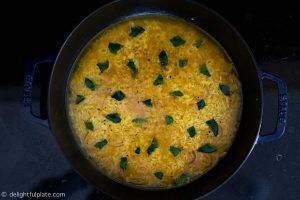 The turmeric powder adds beautiful yellow color and subtle earthiness to the rice. Turmeric also has a lot of health benefits, and Vietnamese people love to use it in cooking. The turmeric rice is unbelievably fragrant thanks to just a few kaffir lime leaves added to the cooking liquid. 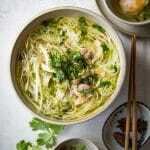 Yes, kaffir lime leaves is the secret ingredient :). (or Le Creuset) will work too. 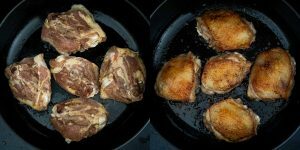 The cooking process starts with searing the chicken in the pan until golden. Then we add the ingredients to make the turmeric rice, place the chicken on top and put the pan in the oven to let them cook and develop the flavors. It’s very easy and straightforward. The trickiest part is, perhaps, getting the ratio of rice and liquid right. The ratio in my recipe works perfectly for me, but if you use a different type of rice, you may need to experiment with it :). Again, I recommend using white jasmine rice or at least try to stick with long grain rice. 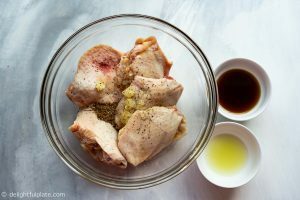 Add all ingredients for the chicken in a mixing bowl and mix thoroughly. If you have time, marinate for 20-30 minutes or longer for tastier results. If not, continue to the next step. Place a heavy bottomed pan over medium heat. Add a little oil and place the chicken skin side down, sear for a few minutes until golden. Flip and sear the other side for a couple of minutes or until golden. Remove from pan. If there is too much fat in the pan, discard and leave just enough to coat the bottom of the pan. Add shallot and sauté until fragrant. Add garlic and sauté for a few seconds until fragrant. Add rice, turmeric powder and salt, stir quickly to coat the rice with turmeric powder. Add chicken stock and water to the pan. Tear the kaffir lime leaves into smaller pieces and spread them over the pan. Sprinkle some black pepper. Bring everything to a low boil. Place chicken thighs on top of the rice. Put on the lid and place the pan in the oven, bake for 20 minutes. Then, remove the lid and bake uncovered for another 20 minutes or until all liquid is absorbed and chicken and rice are cooked through. Remove pan from oven, discard the kaffir lime leaves pieces. Garnish with chopped cilantro. Serve hot. 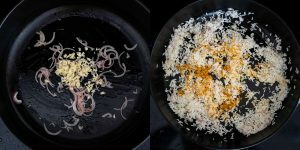 The ratio of rice and liquid in the recipe works perfectly for me, but if you use a different type of rice, you may need to experiment with it :). Again, I recommend using white jasmine rice or at least try to stick with long grain rice.